Events from the year 1809 in Canada. 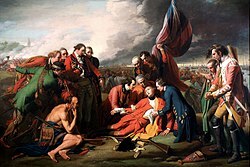 On August 17, the foundation of Nelson's Column, Montreal was laid. November 3: John Molson's steamboat, PS Accommodation, starts for Quebec City. It is 85 feet (26 m) overall, has a 6 horsepower (4.5 kW) engine, and makes the distance in 36 hours, but stops at night and reaches Quebec on November 6. The Accommodation is the second steamboat in America, and probably the world. From 1809 to 1811, Tecumseh, Shawnee chief, and the Prophet campaign to unite tribes of the Great Lakes, Ohio Valley, and Southeast against the United States. His brother Tenskwatawa, the Shawnee Prophet, is defeated at the Battle of Tippecanoe in 1811. Napoleon's continental blockade cuts British access to Scandinavian timber. The North West Company builds Fort Gibraltar. ^ Sandham, Alfred (1870). Ville-Marie, Or, Sketches of Montreal: Past and Present. G. Bishop. p. 342. ^ Brown, George W.; Halpenny, Francess G. (1966). Dictionary of Canadian Biography. Springer Science & Business Media. p. 700. ISBN 9780802033987. This page was last edited on 13 June 2018, at 21:49 (UTC).